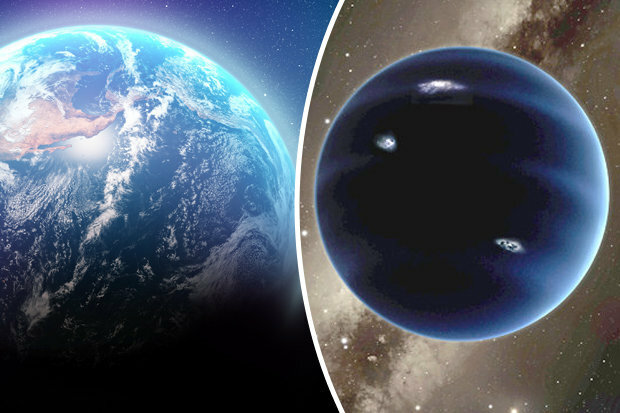 Planet Nine does exist? THAT there is something lurking in the interstellar murk beyond Neptune is almost certain. Exactly what it is and where it is, we’re not so sure. If it truly is the elusive Planet Nine — the theorised planet lurking undiscovered in our solar system — it may take another thousand years before it swings back into view. Astronomers have been peering intently at our skies since 2014. They’re looking for something big — but very distant. A series of studies of the abnormal orbits of large icy asteroids and planetoids on the fringes of our Solar System points to just one obvious explanation — that something had to have tossed them out of their original paths. A planet seems the obvious answer. But it also could be a tight formation of rubble and ice. Either way, calculations of the gravity necessary to push about the distant objects beyond Neptune indicate it must be between five and 20 times more massive than Earth. Astronomers Michael Brown and Konstantin Batygin have inferred a rough outline of the ‘perturbers’ potential elliptical orbit. And it presents a problem. Planet Nine could be drifting out in the most distant edges of its arc. And that could be more than 1000 times more distant than the Earth is from the sun. And it could be hundreds, if not thousands, of years before it swings back into view. Beyond a certain distance — measured as astronomical units (AU) — even a planet 10 times more massive than Earth would be all but invisible. With existing technology, it will be simply reflecting too little light to be seen. At 600 times more distant than the Earth is from the sun, Planet Nine would be 160,000 times dimmer than Neptune (which orbits at 30AU). At 1000 AU, it would be one million times dimmer. And its temperature signature appears too small to be distinguished from the cold void and the distant clutter of stars in the Milky Way. But Brown recently told Quanta Magazine he’s ‘eternally optimistic’ that it will be found, soon. He and fellow astronomer Scott Sheppard are leading attempts to find the planet using the Subaru telescope in Hawaii. However, even he admits that the chances of spotting such a planet if it is beyond 1000AU are next to impossible. Researchers from Queen’s University in Belfast are scouring medieval tapestries and tomes in an effort to identify sightings of unknown comets. Among the records may be clues that lead to the presence of Planet Nine, they say. “Taking a gander at records of comets in Old English, Latin, Old Irish and Russian writings we expect to demonstrate that the early medieval individuals really recorded real galactic perceptions, mirroring their enthusiasm for cosmology and comprehension of the sky,” medievalist Dr Marilina Cesario reportedly said. Among the records will be dates, times and possibly even positions in the sky. Co-researcher and astronomer Dr Pedro Lacerda said these sightings could be added to existing models of comet behaviour. “We can take the orbits of comets currently known and use a computer to calculate the times when those comets would be visible in the skies during the Middle Ages,” Dr Lacerda said. The precise times will be matched with computer simulations. “So, in simple terms, we can use the medieval comet sightings to check which computer simulations work best: the ones that include Planet Nine or the ones that do not. “Any strong indication that a ‘Planet Nine’ is required to fit the comet sightings recorded in the Middle Ages will be a unique result and will certainly have a remarkable impact on our understanding of the solar system. There’s still a chance Planet Nine could soon be ‘seen’. According to cosmologist Gilbert Holder at the University of Illinois, Planet Nine should even now be shining brightly in one particular part of the spectrum — a narrow band between infra-red light and microwaves. And we have telescopes capable of seeing it. Millimetric telescopes are currently sited in Chile and Antarctica. They’re exploring the cosmic microwave background — the leftover light from the Big Bang. But another project is in the works: The Next Generation CMB Experiment. It should be able to detect an Earth-sized planet at 1000AU. “There would be nowhere for Planet Nine to hide once this thing was turned on,” Dr Holder told Quanta Magazine. The switch, however, will not be flicked on for another decade. In the meantime, astronomers are pouring over existing data to find further telltale traces of the mysterious object, and hopefully refine where in the skies it may lay.